This transcript includes the slides that were displayed during the remarks. They are placed in the text approximately where they were displayed in the address. To view the slides, click on the graphic (a pop-up window will appear). POWELL: Resolution 1441 was not dealing with an innocent party, but a regime this council has repeatedly convicted over the years. Resolution 1441 gave Iraq one last chance, one last chance to come into compliance or to face serious consequences. No council member present in voting on that day had any allusions about the nature and intent of the resolution or what serious consequences meant if Iraq did not comply. POWELL: This council placed the burden on Iraq to comply and disarm and not on the inspectors to find that which Iraq has gone out of its way to conceal for so long. Inspectors are inspectors; they are not detectives. POWELL: What you will see is an accumulation of facts and disturbing patterns of behavior. The facts on Iraqis' behavior--Iraq's behavior demonstrate that Saddam Hussein and his regime have made no effort--no effort--to disarm as required by the international community. Indeed, the facts and Iraq's behavior show that Saddam Hussein and his regime are concealing their efforts to produce more weapons of mass destruction. The Al Kendi (ph) Company: This is a company that is well known to have been involved in prohibited weapons systems activity. We know that Saddam Hussein has what is called quote, ``a higher committee for monitoring the inspections teams,'' unquote. Think about that. Iraq has a high-level committee to monitor the inspectors who were sent in to monitor Iraq's disarmament. POWELL: Not to cooperate with them, not to assist them, but to spy on them and keep them from doing their jobs. The committee reports directly to Saddam Hussein. It is headed by Iraq's vice president, Taha Yassin Ramadan. Its members include Saddam Hussein's son Qusay. This committee also includes Lieutenant General Amir al-Saadi, an adviser to Saddam. In case that name isn't immediately familiar to you, General Saadi has been the Iraqi regime's primary point of contact for Dr. Blix and Dr. ElBaradei. It was General Saadi who last fall publicly pledged that Iraq was prepared to cooperate unconditionally with inspectors. Quite the contrary, Saadi's job is not to cooperate, it is to deceive; not to disarm, but to undermine the inspectors; not to support them, but to frustrate them and to make sure they learn nothing. 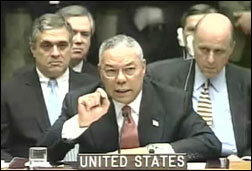 POWELL: Instead, Iraq planned to use the declaration, overwhelm us and to overwhelm the inspectors with useless information about Iraq's permitted weapons so that we would not have time to pursue Iraq's prohibited weapons. Iraq's goal was to give us, in this room, to give those us on this council the false impression that the inspection process was working. POWELL: This is the organization that oversees Iraq's weapons of mass destruction activities. Make sure there are no documents left which could connect you to the OMI. Our sources tell us that, in some cases, the hard drives of computers at Iraqi weapons facilities were replaced. Who took the hard drives. Where did they go? What's being hidden? Why? There's only one answer to the why: to deceive, to hide, to keep from the inspectors. POWELL: While we were here in this council chamber debating Resolution 1441 last fall, we know, we know from sources that a missile brigade outside Baghdad was disbursing rocket launchers and warheads containing biological warfare agents to various locations, distributing them to various locations in western Iraq. Most of the launchers and warheads have been hidden in large groves of palm trees and were to be moved every one to four weeks to escape detection. POWELL: The truck you also see is a signature item. It's a decontamination vehicle in case something goes wrong. This sequence of events raises the worrisome suspicion that Iraq had been tipped off to the forthcoming inspections at Taji (ph). As it did throughout the 1990s, we know that Iraq today is actively using its considerable intelligence capabilities to hide its illicit activities. From our sources, we know that inspectors are under constant surveillance by an army of Iraqi intelligence operatives. Iraq is relentlessly attempting to tap all of their communications, both voice and electronics. POWELL: I would call my colleagues attention to the fine paper that United Kingdom distributed yesterday, which describes in exquisite detail Iraqi deception activities. Iraq also has refused to permit any U-2 reconnaissance flights that would give the inspectors a better sense of what's being moved before, during and after inspectors. POWELL: This refusal to allow this kind of reconnaissance is in direct, specific violation of operative paragraph seven of our Resolution 1441. POWELL: On orders from Saddam Hussein, Iraqi officials issued a false death certificate for one scientist, and he was sent into hiding. My colleagues, operative paragraph four of U.N. Resolution 1441, which we lingered over so long last fall, clearly states that false statements and omissions in the declaration and a failure by Iraq at any time to comply with and cooperate fully in the implementation of this resolution shall constitute--the facts speak for themselves--shall constitute a further material breach of its obligation. POWELL: We wrote it this way to give Iraq an early test--to give Iraq an early test. Would they give an honest declaration and would they early on indicate a willingness to cooperate with the inspectors? It was designed to be an early test. First, you will recall that it took UNSCOM four long and frustrating years to pry--to pry--an admission out of Iraq that it had biological weapons. Second, when Iraq finally admitted having these weapons in 1995, the quantities were vast. Less than a teaspoon of dry anthrax, a little bit about this amount--this is just about the amount of a teaspoon--less than a teaspoon full of dry anthrax in an envelope shutdown the United States Senate in the fall of 2001. This forced several hundred people to undergo emergency medical treatment and killed two postal workers just from an amount just about this quantity that was inside of an envelope. POWELL: Iraq declared 8,500 liters of anthrax, but UNSCOM estimates that Saddam Hussein could have produced 25,000 liters. If concentrated into this dry form, this amount would be enough to fill tens upon tens upon tens of thousands of teaspoons. And Saddam Hussein has not verifiably accounted for even one teaspoon-full of this deadly material. POWELL: Let me take you inside that intelligence file and share with you what we know from eye witness accounts. We have firsthand descriptions of biological weapons factories on wheels and on rails. POWELL: We have diagrammed what our sources reported about these mobile facilities. Here you see both truck and rail car-mounted mobile factories. The description our sources gave us of the technical features required by such facilities are highly detailed and extremely accurate. As these drawings based on their description show, we know what the fermenters look like, we know what the tanks, pumps, compressors and other parts look like. We know how they fit together. We know how they work. And we know a great deal about the platforms on which they are mounted. We know that Iraq has at lest seven of these mobile biological agent factories. The truck-mounted ones have at least two or three trucks each. That means that the mobile production facilities are very few, perhaps 18 trucks that we know of--there may be more--but perhaps 18 that we know of. Just imagine trying to find 18 trucks among the thousands and thousands of trucks that travel the roads of Iraq every single day. POWELL: Ladies and gentlemen, these are sophisticated facilities. For example, they can produce anthrax and botulinum toxin. In fact, they can produce enough dry biological agent in a single month to kill thousands upon thousands of people. And dry agent of this type is the most lethal form for human beings. But Iraq's research efforts did not stop there. Saddam Hussein has investigated dozens of biological agents causing diseases such as gas gangrene, plague, typhus (ph), tetanus, cholera, camelpox and hemorrhagic fever, and he also has the wherewithal to develop smallpox. POWELL: Iraq admitted to producing four spray tanks. But to this day, it has provided no credible evidence that they were destroyed, evidence that was required by the international community. Second, as with biological weapons, Saddam Hussein has never accounted for vast amounts of chemical weaponry: 550 artillery shells with mustard, 30,000 empty munitions and enough precursors to increase his stockpile to as much as 500 tons of chemical agents. If we consider just one category of missing weaponry--6,500 bombs from the Iran-Iraq war--UNMOVIC says the amount of chemical agent in them would be in the order of 1,000 tons. These quantities of chemical weapons are now unaccounted for. POWELL: Yet, to this day, Iraq denies it had ever weaponized VX. And on January 27, UNMOVIC told this council that it has information that conflicts with the Iraqi account of its VX program. For example, Iraq has rebuilt key portions of the Tariq (ph) state establishment. Tariq (ph) includes facilities designed specifically for Iraq's chemical weapons program and employs key figures from past programs. POWELL: What makes this picture significant is that we have a human source who has corroborated that movement of chemical weapons occurred at this site at that time. So it's not just the photo, and it's not an individual seeing the photo. It's the photo and then the knowledge of an individual being brought together to make the case. Iraq's procurement efforts include equipment that can filter and separate micro-organisms and toxins involved in biological weapons, equipment that can be used to concentrate the agent, growth media that can be used to continue producing anthrax and botulinum toxin, sterilization equipment for laboratories, glass-lined reactors and specialty pumps that can handle corrosive chemical weapons agents and precursors, large amounts of vinyl chloride, a precursor for nerve and blister agents, and other chemicals such as sodium sulfide, an important mustard agent precursor. POWELL: Just a few weeks ago, we intercepted communications between two commanders in Iraq's Second Republican Guard Corps. One commander is going to be giving an instruction to the other. You will hear as this unfolds that what he wants to communicate to the other guy, he wants to make sure the other guy hears clearly, to the point of repeating it so that it gets written down and completely understood. Listen. POWELL: Even the low end of 100 tons of agent would enable Saddam Hussein to cause mass casualties across more than 100 square miles of territory, an area nearly 5 times the size of Manhattan. A source said that 1,600 death row prisoners were transferred in 1995 to a special unit for such experiments. An eye witness saw prisoners tied down to beds, experiments conducted on them, blood oozing around the victim's mouths and autopsies performed to confirm the effects on the prisoners. Saddam Hussein's humanity--inhumanity has no limits. POWELL: Nonetheless, Iraq continued to tell the IAEA that it had no nuclear weapons program. If Saddam had not been stopped, Iraq could have produced a nuclear bomb by 1993, years earlier than most worse-case assessments that had been made before the war. POWELL: Second, we actually have examined tubes from several different batches that were seized clandestinely before they reached Baghdad. What we notice in these different batches is a progression to higher and higher levels of specification, including, in the latest batch, an anodized coating on extremely smooth inner and outer surfaces. Why would they continue refining the specifications, go to all that trouble for something that, if it was a rocket, would soon be blown into shrapnel when it went off? It is noteworthy that, over the last 18 months, Saddam Hussein has paid increasing personal attention to Iraqi's top nuclear scientists, a group that the governmental-controlled press calls openly, his nuclear mujahedeen. He regularly exhorts them and praises their progress. Progress toward what end? We know from intelligence and Iraq's own admissions that Iraq's alleged permitted ballistic missiles, the al-Samud II (ph) and the al-Fatah (ph), violate the 150-kilometer limit established by this council in Resolution 687. These are prohibited systems. UNMOVIC has also reported that Iraq has illegally imported 380 SA-2 (ph) rocket engines. These are likely for use in the al-Samud II (ph). Their import was illegal on three counts. Resolution 687 prohibited all military shipments into Iraq. UNSCOM specifically prohibited use of these engines in surface-to-surface missiles. And finally, as we have just noted, they are for a system that exceeds the 150-kilometer range limit. Worst of all, some of these engines were acquired as late as December--after this council passed Resolution 1441. What I want you to know today is that Iraq has programs that are intended to produce ballistic missiles that fly 1,000 kilometers. One program is pursuing a liquid fuel missile that would be able to fly more than 1,200 kilometers. And you can see from this map, as well as I can, who will be in danger of these missiles. Iraq has been working on a variety of UAVs for more than a decade. This is just illustrative of what a UAV would look like. This effort has included attempts to modify for unmanned flight the MiG-21 (ph) and with greater success an aircraft called the L-29 (ph). However, Iraq is now concentrating not on these airplanes, but on developing and testing smaller UAVs, such as this. POWELL: There is ample evidence that Iraq has dedicated much effort to developing and testing spray devices that could be adapted for UAVs. And of the little that Saddam Hussein told us about UAVs, he has not told the truth. One of these lies is graphically and indisputably demonstrated by intelligence we collected on June 27, last year. Not only is this test well in excess of the 150 kilometers that the United Nations permits, the test was left out of Iraq's December 7th declaration. The UAV was flown around and around and around in a circle. And so, that its 80 kilometer limit really was 500 kilometers unrefueled and on autopilot, violative of all of its obligations under 1441. But what I want to bring to your attention today is the potentially much more sinister nexus between Iraq and the Al Qaida terrorist network, a nexus that combines classic terrorist organizations and modern methods of murder. Iraq today harbors a deadly terrorist network headed by Abu Musab Al-Zarqawi, an associated in collaborator of Osama bin Laden and his Al Qaida lieutenants. Zarqawi, a Palestinian born in Jordan, fought in the Afghan war more than a decade ago. Returning to Afghanistan in 2000, he oversaw a terrorist training camp. One of his specialities and one of the specialties of this camp is poisons. When our coalition ousted the Taliban, the Zarqaqi network helped establish another poison and explosive training center camp. And this camp is located in northeastern Iraq. POWELL: You see a picture of this camp. The network is teaching its operatives how to produce ricin and other poisons. Let me remind you how ricin works. Less than a pinch--image a pinch of salt--less than a pinch of ricin, eating just this amount in your food, would cause shock followed by circulatory failure. Death comes within 72 hours and there is no antidote, there is no cure. It is fatal. We know these affiliates are connected to Zarqawi because they remain even today in regular contact with his direct subordinates, including the poison cell plotters, and they are involved in moving more than money and materiale. We, in the United States, all of us at the State Department, and the Agency for International Development--we all lost a dear friend with the cold-blooded murder of Mr. Lawrence Foley in Amman, Jordan last October, a despicable act was committed that day. The assassination of an individual whose sole mission was to assist the people of Jordan. The captured assassin says his cell received money and weapons from Zarqawi for that murder. POWELL: After the attack, an associate of the assassin left Jordan to go to Iraq to obtain weapons and explosives for further operations. Iraqi officials protest that they are not aware of the whereabouts of Zarqawi or of any of his associates. Again, these protests are not credible. We know of Zarqawi's activities in Baghdad. I described them earlier. According to detainee Abuwatia (ph), who graduated from Zarqawi's terrorist camp in Afghanistan, tasks at least nine North African extremists from 2001 to travel to Europe to conduct poison and explosive attacks. POWELL: Going back to the early and mid-1990s, when bin Laden was based in Sudan, an Al Qaida source tells us that Saddam and bin Laden reached an understanding that Al Qaida would no longer support activities against Baghdad. Early Al Qaida ties were forged by secret, high-level intelligence service contacts with Al Qaida, secret Iraqi intelligence high-level contacts with Al Qaida. POWELL: His information comes first-hand from his personal involvement at senior levels of Al Qaida. He says bin Laden and his top deputy in Afghanistan, deceased Al Qaida leader Muhammad Atif (ph), did not believe that Al Qaida labs in Afghanistan were capable enough to manufacture these chemical or biological agents. They needed to go somewhere else. They had to look outside of Afghanistan for help. Where did they go? Where did they look? They went to Iraq. POWELL: His campaign against the Kurds from 1987 to '89 included mass summary executions, disappearances, arbitrary jailing, ethnic cleansing and the destruction of some 2,000 villages. He has also conducted ethnic cleansing against the Shi'a Iraqis and the Marsh Arabs whose culture has flourished for more than a millennium. Saddam Hussein's police state ruthlessly eliminates anyone who dares to dissent. Iraq has more forced disappearance cases than any other country, tens of thousands of people reported missing in the past decade. For more than 20 years, by word and by deed Saddam Hussein has pursued his ambition to dominate Iraq and the broader Middle East using the only means he knows, intimidation, coercion and annihilation of all those who might stand in his way. For Saddam Hussein, possession of the world's most deadly weapons is the ultimate trump card, the one he most hold to fulfill his ambition. POWELL: Indeed, by its failure to seize on its one last opportunity to come clean and disarm, Iraq has put itself in deeper material breach and closer to the day when it will face serious consequences for its continued defiance of this council.